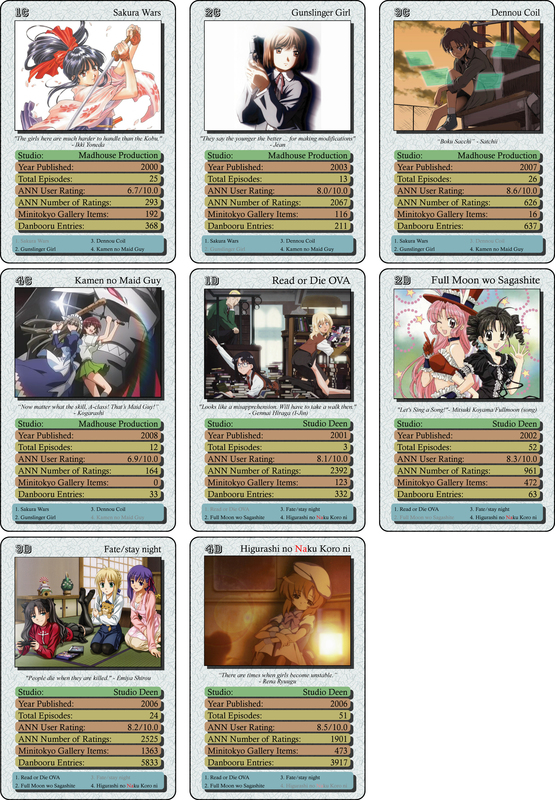 As announced here are the next 8 cards for the anime top trump set. This time the featured studios are Madhouse Production and Studio Deen, both having a rather broad spectrum in story themes and in quality of their animation. In fact I was pretty surprised about which basically different animes were produces by the same studio, because I never really took notice of the producing studio while watching anime until recently. Of course it’s quite natural for a big studio to produce on different quality levels and within different anime themes, but I just haven’t bothered to think about it until now. And eight Hackers to put me in amaze. Dennou Coil is a very interesting anime with quite an unique story settled in a not so far future. The internet has developed into a virtual reality overlay of the real world. It’s used to make walls and floors look better and cleaner, virtual pets and toys are available. To see and interact with this virtual world special eyeglasses are necessary but also not very expensive, so almost everybody owns one. But like the internet today there are bugs, cheats, viruses and tools deployed and exploit by talented hackers to bend the system at their will, as long as they are better than the counter-measurements, implied to protect and maintain the virtual world, and, of course, other hackers who aim for the same goal. This combination of real and virtual reality is pretty compelling and serves for many spectacular effects. At first the character design and artwork felt a bit strange, but combined with the excellent animation quality it soon deploys its own beauty. Rounded off with it’s likeable set of characters (mostly school kids btw) this anime just gets better and better with each episode. Okay, I still don’t like the dog, but hey, nothing is perfect. You are currently browsing the archives for the Dennou Coil category.